Unlike the other playtest fleets I’ve presented thus far, the Kharadorn have been divided into two pictures. The “main body” above, which consists of the ships that match, and “raiders” (which I’ll talk about later). The big one in the middle is a Rerroarak battle carrier. 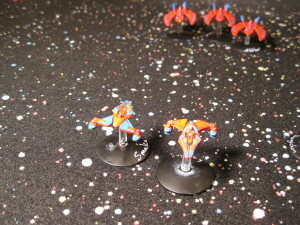 The medium-sized ones in the back are Nargaro light cruisers, and the little guys on the right are Gerrakk frigates. 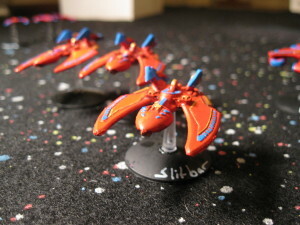 A final problem unique to the Kharadorn is that none of the ships in the “main body” swoosh right. While the fleet looks great together, the individual ships look wrong by themselves. 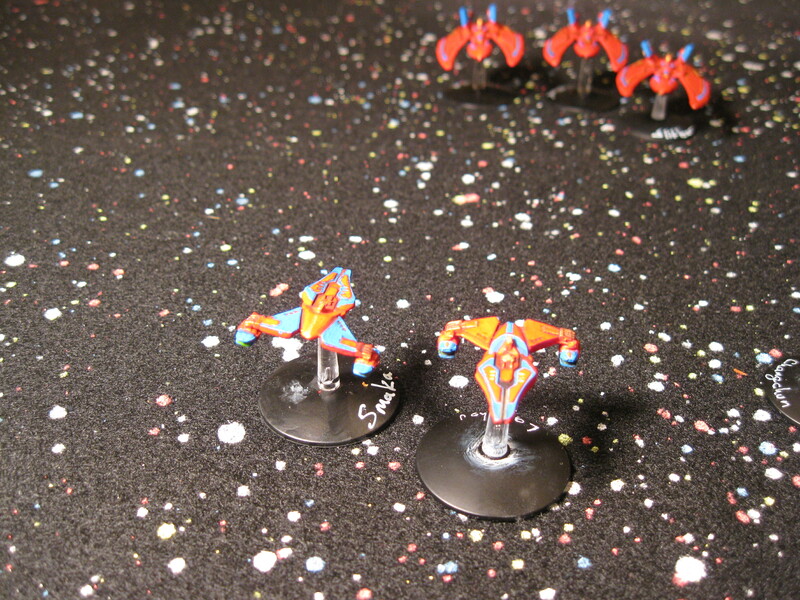 There’s a tendency for new players to try to face them backwards — at least, until they see the entire fleet arrayed. 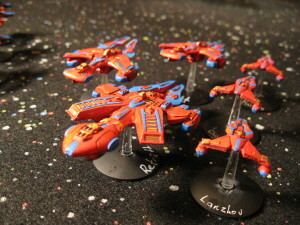 Unlike the other posted Cold Navy fleets, the first picture contains some Ravenstar resin models (all the Gerrakks). My original Gerrakks were assembled wrong, hence the picture above. The example on the left was assembled backwards to make it swoosh better. Unfortunately, it and my other metal ones look totally out of place in a fleet shot, especially after they’ve been painted. This entry was posted in Fleets and tagged cold navy, fleets, playtest. Bookmark the permalink.